I’ve spent some time trying not to bake, but I still love cookies. The best cookies, of course, are made with love. Other than love, you can add things like butter, sugar, and chocolate to make them taste great or you can go with a challenge. 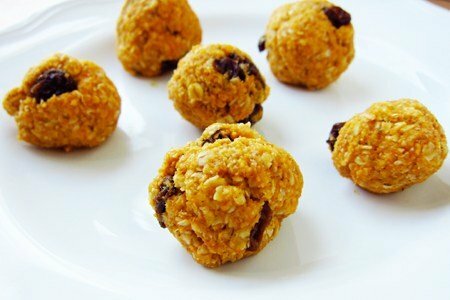 How about pumpkin, oats, and raisins? These might not be met with the same enthusiasm as a fresh baked chocolate chip cookie, but they can satisfy that “I NEED a cookie” impulse that goes with your afternoon coffee. I will be honest with you, my children were a bit unhappy with these. I made the mistake of telling them that I was making cookies and they took one look and said, “Those aren’t cookies!”. In retrospect, I should have added some mini chocolate chips for them instead of the raisins to convince them that these were a treat. You can try that and see if your kids like them more than mine did. I find these to be like a combination of pumpkin pie and an oatmeal raisin cookie. They are fun to make and require one bowl, no oven, and very little clean up time. This recipe uses quick oats. If you only have rolled oats, pulse them a few times in a food processor to make the size of the oat much smaller. Quick oats are just chopped up rolled oats. These cookies can be gluten-free if you use gluten-free certified oats. I used canned pumpkin which you can find in the baking section. Does anyone have ideas for what you could do with the rest of the can? What do you do with two-thirds of a can of pumpkin? Combine all the dry ingredients. Mix in the wet ingredients and roll into balls. Serve or refrigerate them for later consumption. What to do with 2/3 of a can of pumpkin? You could freeze it in two portions to make your cookies again soon. Or, make a homemade pumpkin spice latte, pumpkin muffins, etc. Pumpkin freezes pretty well. It's very good for dogs! You can make a yummy pumpkin soup by heating the pumpkin with a little half & half and pumpkin pie spice or nutmeg. Yummy! You can also add 1/2 a can to 1/2 a box of brownie mix and make a small tray of brownies. Add nothing else - just the pumpkin. Keep stirring and bake. You can't even taste it and the brownies are much healthier. These look good. I'd love to see more pumpkin recipes for fall!! Save the pumpkin in a bowl in the refrigerator; use it for breakfast the next few days!. Stir 1/4 to 1/3 cup of the pumpkin into a bowl of piping hot oatmeal, add some ground flaxseed, vanilla protein powder, cinnamon, turmeric (start w/ 1/8 t. and work your way up--it's an acquired taste ;-) and ground ginger, stir together and enjoy! You've just eaten a serving of veggies for breakfast...yea!! Another great way to use up the pumpkin is to add it to your next batch of chili! Yes, I said chili. It makes it thick and rich. You won't taste the pumpkin flavor, but will benefit from all the health benefits. You can add almond milk, ice, and pumpkin pie spice, some caramel flavor to pumpkin and toss it in the blender...mmmmm a pumpkin smoothie. I can't wait to try these!! There have been alot of pumpkin smoothie recipes floating around...I think that I would have try one with the leftover pumpkin! I love Fall! Bring on the pumpkins and apples! Leftover pumpkin? You make a pumpkin shake, of course! :-) OK, well, two pumpkin shakes! A third of a cup of pumpkin, a half cup of non-fat plain Greek yogurt, a squirt of agave or honey, a little pumpkin pie spice, cinnamon, and nutmeg, and process with some ice in a blender until it reaches the desired consistency. I always top mine with some granola that I have handy in the fridge. Or, my other favorite leftover pumpkin thing... I keep some very ripe bananas in the freezer to throw in the food processor when I'm craving ice cream. When I have leftover pumpkin, I throw it in a baggie in the freezer, and when I'm ready for ice cream, I take out the banana and pumpkin, and let them thaw a little on the counter. I throw them both in the food processor with a dash or two of cinnamon and just let it go until it's all creamy and yummy. You can chuck it back in the freezer if you want your "ice cream" a little more firm. These recipe looks great and i have to try it. Left over pumpkin? Besides smoothies and ice cream, i use it in baked oatmeal. Love that when it turns cooler! Too make them more "cookie-like" could you flatten them out, rather than leave them as balls? Pumpkin pancakes!Though I love the idea for my dog and the oatmeal. it is great in chili too! Yay pumpkin! They look fantastic, can't wait to try it out! My dog gets pumpkin and some coconut oil since both are good for her. I use pumpkin in oatmeal, soup, a pumpkin spice latte, pumpkin smoothies and I smooth some on my face with oatmeal & brown sugar for a great mask. (it also tastes pretty good). I second the pumpkin chili idea....it is so delicious and what a great health boost it gives turkey chili!